The US Department of the Interior has approved Shell's plan for deepwater oil and natural gas exploration in the Gulf of Mexico, the first plan approved since the BP oil spill. Meanwhile, a new oil spill has begun to wash ashore in the US. The US government has added tougher standards and environmental reviews to deepwater exploration, but many remain apprehensive. Speaking on the approved Shell plan, US Secretary of the Interior Ken Salazar said, "This exploration plan meets the new standards for environmental review and marks another important step toward safer deepwater exploration." Shell will be drilling three wells approximately 130 miles off the Louisiana coastline. In addition to Shell there are at least 13 other deepwater plans pending approval. While new drilling begins in the gulf, oil continues to flow ashore along the US Gulf Coast. 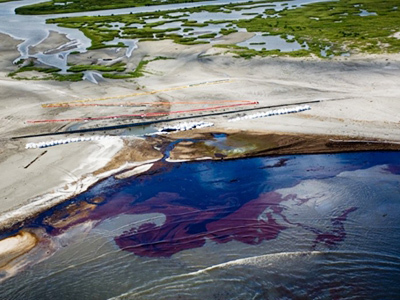 Fresh spill oil has washed ashore recently in Grand Isle, Louisiana. Crude oil has found its way onto the beaches yet again. The US Coast Guard said the oil appears to be leaking for a drilling rig near Grand Isle, but details remain scares because they are unsure of the absolute source of the leak. Initially the Coast Guard claimed the dark sludge was silt spilling in from the Mississippi River, local residents and environmental groups disagreed. “They could smell it from the airplane and I could smell it from the boat. This wasn't just Mississippi River mud,” said Mike Roberts of the Louisiana Bayoukeepers, a member of the Waterkeeper Alliance and an environmental group. The US has now mounted a cleanup effort, however until the leak can be found and stopped, cleaning up the oil may prove frivolous. Oil spill crisis: Follow the money!